Though he is principally known as a sculptor, Bourdelle also made a significant number of paintings and drawings—mostly portraits and figure compositions, but also a small number of landscapes and an even smaller number of still lifes. His two-dimensional work ranges widely in style, but overall lacks the intensity, drama, and movement of his sculpture. 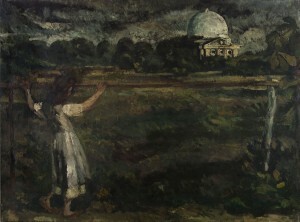 L’ Observatoire de Meudon is typical of his landscape compositions, which are often broadly painted and impressionistic. The subject of this canvas, also known as the Paris Observatory, is located on the Left Bank of the River Seine in Central Paris and has been one of the foremost astronomical centers in the world since it was established in the seventeenth century. For his paintings, see Jean Selz, Bourdelle Peintre 1861-1929 (Paris: 666 Éditions, 1986). For drawings, see Stéphane Cantarutti, Antoine Bourdelle—que du dessin, exh. cat. (Paris: Paris Musées Éditions, 2011). The paintings were Portrait (not dated, unknown location) and Observatoire de Meudon. The sculptures included two bronzes, Tête d’Apollon (1900) and Heracles (now titled Herakles Archer, 1908-1909), and two plasters, Une Muse (1912) and Le Matin (not dated). The locations of all of the casts are unknown. Bourdelle offered all of his works for sale at the Armory Show, including L’Observatoire de Meudon, which was listed at $270. Only one, the 1900 bronze Tête d’Apollon, was sold. L. Merrick, “The Armory Show,” American Art News XI: 21 (March 1, 1913), 2. The influential French sculptor, painter, and draftsman Emile-Antoine Bourdelle was born in Montauban, France, and began working in sculpture around age thirteen as a woodcarver in his father’s cabinet-making shop. Montauban had also been the birthplace of the painter Jean-Auguste-Dominique Ingres, and as a youth Bourdelle studied drawing with the founder of the Musée Ingres there. At age fifteen he won a scholarship for admission to the École des Beaux-Arts in Toulouse, where he studied sculpture. At twenty-four Bourdelle won a scholarship to the École des Beaux-Arts in Paris, where he worked in the studio of the sculptor and painter Alexandre Falguière. In rebellion against academic training, Bourdelle left the École after two years and moved into a house on the Impasse du Main which is now the Musée Bourdelle. From 1893 to 1908 he worked as an assistant in the studio of Auguste Rodin. It was during this period that Bourdelle completed his first major commission, the War Memorial at Montauban (1895-1902). See Carol Marc Lavrillier and Michel Dufet, Bourdelle et la Critique de Son Temps, reprint (Paris: Paris Musées Éditions, 1992). See Helena Staub, Bourdelle et Ses Élèves: Giacometti, Richier, Gutfreund, exh. cat. (Paris: Paris Musées Éditions, 1998).